Borussia Dortmund have roared to the top of the Bundesliga table with an undefeated record after six games. 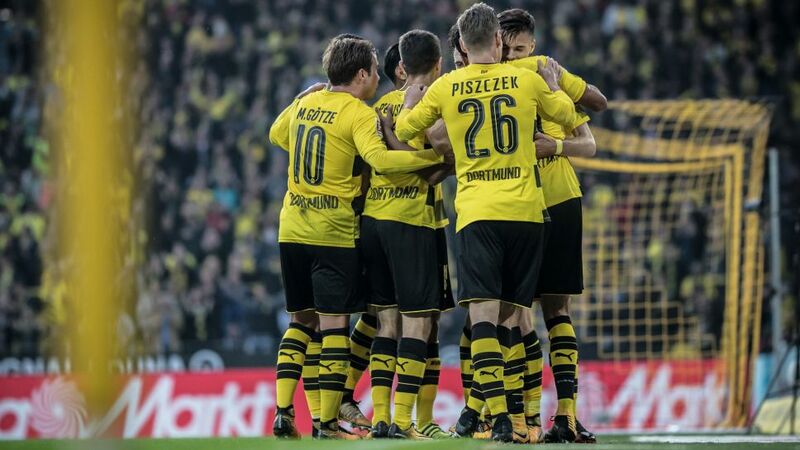 Saturday’s 6-1 win over Borussia Mönchengladbach lifted Die Schwarzgelben’s goal-difference to +18 – a league record at this stage – but what other benchmarks have Peter Bosz’s men set? BVB have conceded the fewest goals in the division, with Lars Stindl’s consolation on Saturday the lone tally against them. Prior to that strike, Bosz had become the first coach in BVB history to keep a clean sheet in each of his first five games. Only one goal conceded after six Bundesliga games is also a club record for Dortmund. BVB have been top of the table for six consecutive weeks. The last time they managed this was in the 2013/14 season when they led the way from Matchdays 2 to 7, before eventually finishing as runners-up to Bayern Munich. Pierre-Emerick Aubameyang leads the scoring charts with eight goals. Last season’s Torjägerkanone winner with 31, the Gabon captain had never before scored in each of his first six Bundesliga games of a season. Watch: Auba: "The race is on!" Dortmund have 16 of a possible 18 points – their best ever haul at this stage of a season. BVB’s goal difference of +18 is also the club’s best return after six matchdays. Indeed, it’s the best goal difference any club has had at this stage of a season. Watch: Bartra, Pulisic and Sahin each had Goal of the Month contenders in August! Dortmund have scored the most goals in the division with 19. Aubameyang has scored eight of those; Maximilian Philipp four, and Christian Pulisic two. Marc Bartra, Sokratis, Nuri Sahin, Shinji Kagawa and Julian Weigl have one each. Dortmund are undefeated in 41 Bundesliga games at their Signal Iduna Park, an ongoing club record. Die Schwarzgelben haven’t tasted defeat at home in the league since April 2015, when Bayern edged them 1-0 thanks to Robert Lewandowski’s first-half strike against his former employers. It has been 44 years since a player had a more prolific start to a Bundesliga season than the one Aubameyang is currently enjoying. Former Bayern and Real Madrid coach Jupp Heynckes bagged nine in the first six games for Gladbach in the 1973/74 season. Dortmund have been bossing the ball with their average of 68 per cent of possession another league high. Sokratis, meanwhile, has completed 94 per cent of his passes. Dortmund also boast the best pass-completion rate in the Bundesliga with 89 percent. Stindl’s goal for Gladbach was the first time BVB had conceded in 515 minutes of football.